Sagada is a mysterious village in a mountainous province of the Philippines, about 250 miles from Manila. It’s just under a mile above sea-level and situated near the Chico River, much of it on switch back mountain roads. On my visit, I went by car from Manila to Banaue, followed by six hours in a private jeepney (a vibrant, rustic mode of transportation unique to the Philippines) to Sagada. It was a long and treacherous trip, but I was to discover it to be well worthwhile. Pine forests dominate the scene in Sagada. Sagada immediately exuded a different feel to the rest of the Philippines. Rather than a palm tree-dominated landscape, here I discovered lush pine forests. In this fertile region, many agricultural products are grown, including Arabica coffee, brought by the Spanish colonialists, which is one of my personal favorites. Also grown here are green peppers, potatoes, tomatoes and Valencia oranges. Such items were brought to the Philippine Islands by a man named Jaime Masferre, who sought to feed American missionaries working with the Mission of Saint Mary the Virgin, though it was the Americans who brought the pine trees. The Americans also brought apples and strawberries, which flourish here because of the climate: the lowlands can get cool, and if you were an apple, you’d love it here. 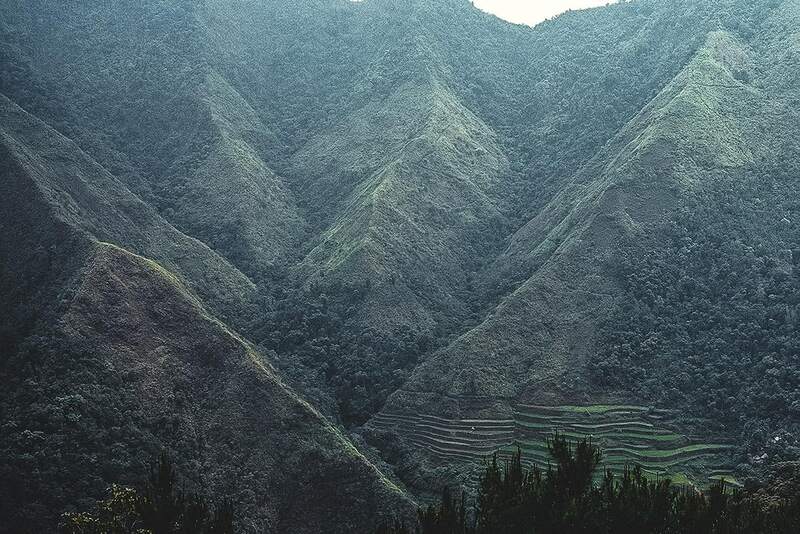 Rice terraces on the outskirts of Sagada rival those in neighboring Ifugao province. Sagada has mountains, and a plethora of caves, as well as rice terraces that rival those found in bordering Ifugao province. But what is most notable about this place are the coffins that can be seen hanging precariously from the sides of mountains and in the area’s numerous caves. A later visit to Torajaland in Indonesia made me feel that there must be some ancient link between these two cultures. Placing coffins within caves or hanging them on the sides of mountains is still practiced in these cultures today. To be buried in this fashion, something that has been happening for 2,000 years, one must have been married and have had grandchildren. 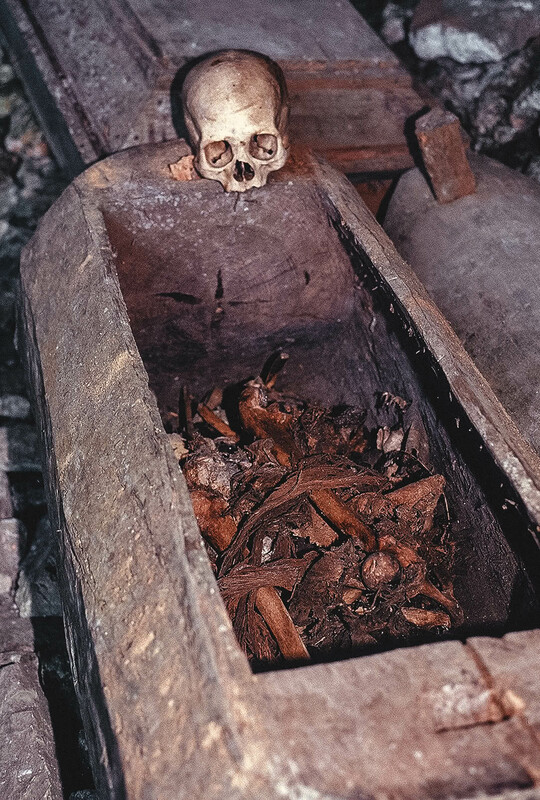 The coffins are normally carved by the elderly Igorot people themselves before they pass away. Coffins and bones seem to be everywhere in Sagada – filling caves and hanging off the sides of cliffs. We in the west have very different ways of dealing with death, and many may find such practices morbid and strange. In places like Sagada, visitors have the unique opportunity to experience an authentic culture dealing with death, free of Western influence. The town is popular with local tourists and foreign backpackers. However, accommodation in Sagada is very basic: the guesthouses are one- or two-star at best. For those willing to rough it for a couple of days, though, it is a very interesting, unique experience. My guesthouse had no hot water, and no shower at all: there was only a big bucket of cold water you had to pour over yourself in the freezing morning air – a wake up call far more effective than coffee, to say the least. The Igorot people have been hanging coffins for 2,000 years. Many coffins are open, with the bones scattered about. Local legend has it that Sagada was originally founded by Biag, a man from a place called Bika. The people of Bika were driven from their established home by headhunters. What were these headhunters searching for? No one is sure. Also interesting is the fact that in a country with a 90% Roman Catholic population, Sagada is 95% Protestant, due to the influence of Protestant American missionaries. I spent my two days in Sagada visiting many caves, each stacked with coffins. I also embarked on a trip to an underground river and had my first spelunking experience in Sumaguing Cave, aptly translated as “Big Cave.” There are apparently 60 known caves under Sagada and I decided to go check one out, not knowing what I was getting myself into. Sumaguing Cave in Sagada was a lot more challenging than I expected! We entered the cave with our guide, who was clutching a gas lamp to light our way. We immediately climbed deep into the cave’s depths, and it was soon obvious that there was no going back. Indeed, I was told that there was only one way out. The cave was beautiful, filled with stalactites and stalagmites, but to be honest, I felt uneasy. I’m not a cave-lover per se: tightspaces and water under the Earth can come across as daunting to me…and we were walking through freezing water that often reached our waists. We climbed deeper and deeper though narrow passages, like Indiana Jones on a mission. On our way, we passed plenty of bat guano, which is not only smelly but can cause you to slip and fall. There are more than 60 caves beneath Sagada. One passage was extremely narrow — probably 2.5 feet wide, with water pouring through it. To make matters worse, we soon came to a hole that required slipping through at a 90-degree angle. I have never considered myself claustrophobic, but on this day I felt just that. It took about two hours before I emerged on the other side (though it felt much longer!). I’ve heard that the cave can be quite full of tourists, but on this day, only a German couple were among our company amongst the cave’s tight walls. Sagada is truly amazing. Trekking, waterfalls, photography, picnics, bonfires, rappelling and tribal culture make it a memorable, of-the-beaten-path destination ideal for nature-lovers. If you wish to see something truly out-of-this-world, and truly authentic, then Sagada is ideal for you.